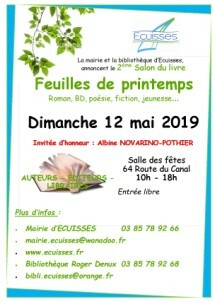 Appearance in Feuilles de printemps, the Ecuisses book fair (71210). From 10:00 am to 6:00 pm. Alain Crozier will dedicate books. Salle des fêtes, 64 route du Canal, 71210 Ecuisses. Free. 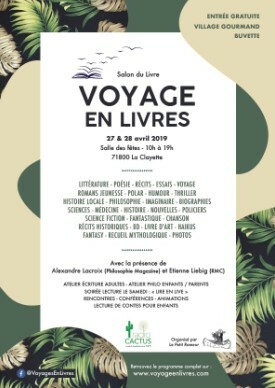 Appearance in Voyage en Livres, the new La Clayette fair book. Alain Crozier will dedicate books. Salle des fêtes, 80 rue Lamartine, 71800 La clayette. Appearance in the famous Fête du livre d'Autun, with some stars. Alain Crozier will dedicate books. From 10:00 am to 6:30 pm. 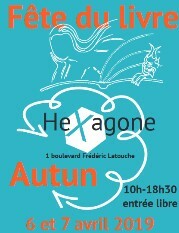 Salle de l'Hexagone, 1 boulevard Frédéric-Latouche, 71400 Autun.. Free. Publication Nuit marine, new Alain Crozier's book by Jacques André Editeur. Publication La couleur de la guérison, La fidélité, Il n'y a pas de château aux Etats-Unis, Nos sentiments nous disent in the review La Lettre de Sortie de secours n°40 (Lyon). Publication Il n'y a pas de château aux Etats-Unis, Le prochain sur la liste, Qu'avons-nous fait de ces cinq ans ? unreleased poems, in the review Le Capital des Mots (Paris). Appearance in Journées des Ecritures de Cluny (71250) . From 10:00 am to 7:00 pm., Alain Crozier will dedicate books. Appearance in the book market Festival international de la Baraque au Creusot (71200). Free. From 2:00 pm to 6:00 pm, Alain Crozier will dedicate books. Appearance in the Biennale Internationale d’Art Contemporain of Marcigny (71110), with 7 sculptures, at Espace DLM, just in front of the church exit. Appearance in the movie "Brume et Feuilles d'or" by Antonella Eye Porcelluzzi. 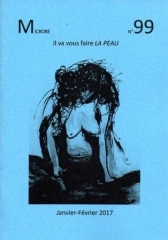 Publication Avec toi, Je mange ta main, poems from next books, in the review A Poil n°5 (Toulouse). Exhibition during National Jumping in the majestic place of castle park and orangery, "Les contes de La Clayette", clip frames with original illustrations by Catherine Perret, from the book "La Cité des Clés" and manuscript poems from the book. 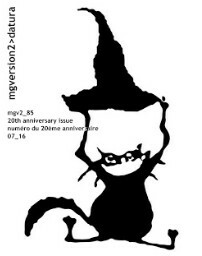 Publication Morphine, Profondeur de la nuit, Vision d'Eden, poem from a next book, in the review Mauvaise Graine n°87 (Lecate). Publication Arrêter ce bien-être, poem from a next book, in the review Microbre n°99 (Pont à Celle, Belgique). 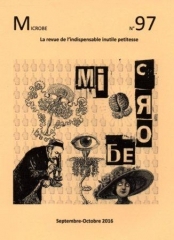 Publication Lune, poem from a next book, in the review Microbre n°97 (Pont à Celle, Belgique). Publication Nuit norvégienne, poem from a next book, in the review Mauvaise Graine, issue 85, special 20th anniversary, july 2016. Issue to download on website review.